CATOOSA COUNTY, Georgia -- A dispute over a Georgia veteran's funeral has captured the attention of thousands on social media. 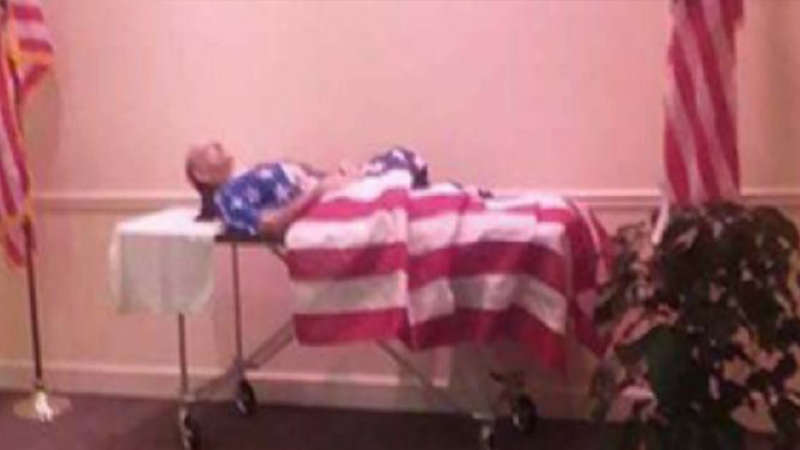 Family members of George Taylor shared pictures of the veteran's body displayed on a gurney with a flag draped on top, WTVC reports. There was no coffin for the visitation that happened at Heritage Funeral Home on Battlefield Parkway. Taylor's family said Heritage Funeral Home in Fort Oglethorpe refused to put Taylor in a casket because of problems with his life insurance payment. "At first we were okay with it but like I told the guy, I said this was very disrespectful to my dad," said Taylor. Taylor's son, James Taylor, said they were given little to no notice prior to the visitation of the problem. He also claims the funeral home refused to bury his father until they received payment. "They came to me and told me that unless 9,000 dollars was paid, they couldn't put him into the ground," said Taylor. "He would have to sit in the freezer until we paid it or (until) the insurance came through." Funeral home representatives said they did what the family asked. "We were trying to honor the request and let them have some closure by viewing their loved one," David Cummings with the funeral home said. They also said they did nothing wrong in the matter and their main priority is serving their community. "We serve this community," said Cummings. "We love the community. We serve this community in everything we do." They also said since the photo was shared on social media, they've been receiving threats from the community. The veteran's sister-in-law said she disputes Taylor's claims and said she sides with the funeral home. She claims that the family all agreed that they were "okay" with the way Taylor looked during the visitation. "We shook on it. The three of us shook on it and then all of a sudden, somebody comes in and wants to stir up trouble," said Beverly Roe. "These guys haven't done anything. They were so nice." The funeral home and the family came to an agreement before Friday afternoon's service. Taylor was placed in a coffin in time for the service and the burial.